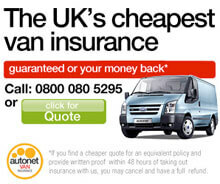 Stoke Vans have a dedicated team of finance experts waiting to help with your enquiry. If you would like to apply for finance, please complete the application form below, or feel free to call 01782 566939 for further information. LB Commercials Ltd t/a Stoke Vans is authorised and regulated by the Financial Conduct Authority, FRN: 807397. All finance is subject to status and income. Written Quotation on request. We act as a credit broker not a lender. We work with a number of carefully selected credit providers who may be able to offer you finance for your purchase. We are only able to offer finance products from these providers.